The binary options trading industry is rife with unregulated brokers, therefore it is essential to do your homework and select reliable ones with whom you can trust your money. We help you in this task by providing detailed reviews of top binary options brokers on our website. In this article, we closely analyze the key features and benefits offered by IQ Option. Traders in Europe need not worry as IQ Option Europe is regulated and licensed by CySEC in Cyprus. However outside Europe, IQ Option is not regulated. Their email address is: support@iqoption.com and phone number is +44 20 8068 0760. 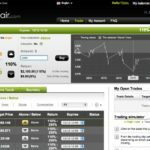 IQ Option reviews show that the broker has built their own custom trading platform. A notable feature of the platform is it provides speed trading in increments up to five minutes. Binary options go out one hour in 15-minute increments. In addition, expiry times can extend up to one month. Besides English, the platform is available in French, German, Italian, Spanish, Russian, Arabic, Korean, Swedish, Chinese, Portuguese, Indonesian, and Turkish. Earlier this year, IQ Option introduced a new product named Digital Options. You can trade in more than 500 assets, but the only commodity offered is gold. Plus, you can utilize mobile trading apps for iOS and Android devices. This broker offers weekly trading competitions that have become popular among investors. You can try out the free demo account and the minimum required deposit is just $10. According to IQ Option reviews the broker offers a free demo account that you can utilize to learn about the platform’s features and tools. 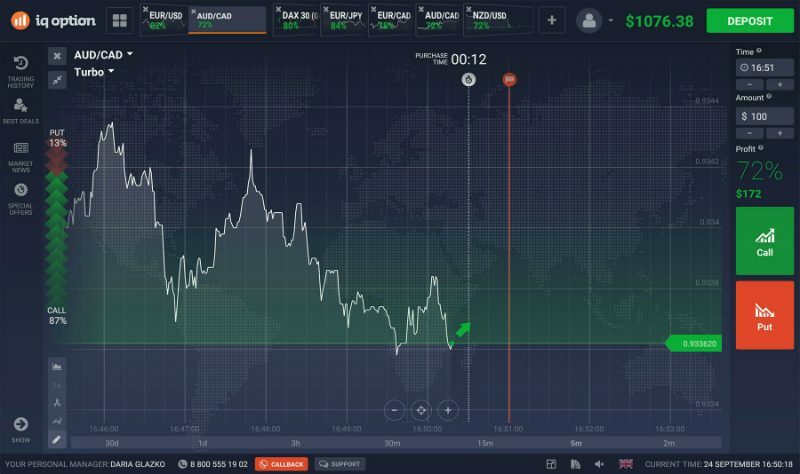 The demo trading is similar to trading on the live platform and enables you to improve your skills without investing any money. You get $10,000 in virtual funds that you can use like real money. If you exhaust this amount, you get an immediate refill. You can use the demo account to trade with all assets. IQ Option offers binary options, classic options, forex CFDs, and cryptocurrencies CFDs. Minimum trade price is just $1 and maximum option price is $5,000. The platform allows you to place multiple trades with multiple instruments. The payout rate is up to 95%. In addition to binary options, IQ Option also offers Forex and CFD trading. This allows you to expand your trading portfolio with leading financial instruments. The heartening aspect for traders is both forex and CFD trading are only offered by brokers who follow stringent licensing rules. Thus, traders are assured of a high level of protection when they invest in IQ Option. What makes IQ Option stands out from run-of-the-mill binary options brokers is their constant technological innovation. Keeping up with this reputation, they have introduced trading in cryptocurrencies and this has been well received in the market. Now, you can buy and sell cryptocurrenices on the IQ Option trading platform. Seven top cryptocurrencies are supported: Bitcoin, Bitcoin Cash, Ripple, IOTA, Ethereum, Dash, and Litecoin. The trading is simple but we recommend you to do proper research on these currencies before starting to trade in them. In line with top binary options brokers, IQ Option also offers excellent customer support via phone, email, and webform. You can contact their agents 24/7. However, live chat support is not available. If you are using the demo account, you cannot avail support until you upgrade to a paid account. IQ Option offers multiple convenient deposit and withdrawal methods such as: credit cards (Visa and Mastercard), debit cards (Visa Electron and Maestro), bank wire, and e-wallets (CashU, Boleto, FasaPay, Neteller, iDeal, WebMoney, QIWI, Moneybookers, and Skrill). The minimum withdrawal amount is $2 and the daily maximum limit is $1 million. It is advisable for newbies to learn the ropes of binary options trading by making use of educational materials. IQ Option helps both newbies as well as experienced traders by providing a well-stocked library of video tutorials, webinars, e-books, and other materials on successful trading strategies. In addition, you can check out the FAQ section on their website to learn all about the trading platform and other main features. On the pros side, we count the excellent trading platform, user-friendly interface, wide range of trading options, high rate of returns up to 95%, small minimum investment amount, CySEC regulation, interactive learning tools, and free demo account. On the flip side, they don’t accept traders from the US, Australia, Canada, Russia, Japan, Palestine, Israel, Iran, North Korea, Sudan, Syria, and Turkey. To sum up, IQ Option is a reliable broker that stands out for its innovative and versatile features. withdraw $160 only recieved R120- was told the other $40 will reflect in 11 working days , this happend onthe 01st of Jan 2019. From my experience with several brokers, i think IQ options is a really great platform. I have been swindled by many of these scam brokers and although i got my money back with the help of contactpaulreynolds on gmail, i am thankful that there are actually legit brokers like IQ options.